For other uses, see Sochi (disambiguation). Sochi (Russian: Со́чи, IPA: [ˈsotɕɪ] ( listen)) is a city in Krasnodar Krai, Russia, located on the Black Sea coast near the border between Georgia/Abkhazia and Russia. The Greater Sochi area, which includes territories and localities subordinated to Sochi proper, has a total area of 3,526 square kilometers (1,361 sq mi) and sprawls for 145 kilometers (90 mi) along the shores of the Black Sea near the Caucasus Mountains. The area of the city proper is 176.77 square kilometers (68.25 sq mi). According to the 2010 Census, the city had a permanent population of 343,334, up from 328,809 recorded in the 2002 Census, making it Russia's largest resort city. Being part of the Caucasian Riviera, it is one of the very few places in Russia with a subtropical climate, with warm to hot summers and mild winters. With the alpine and Nordic events held at the nearby ski resort of Rosa Khutor in Krasnaya Polyana, Sochi hosted the XXII Olympic Winter Games and XI Paralympic Winter Games in 2014, as well as the Russian Formula 1 Grand Prix from 2014 until at least 2020. It was also one of the host cities for the 2018 FIFA World Cup. Before the whole area was conquered by Cimmerian, Scythian and Sarmatian invaders, the Zygii people lived in Lesser Abkhazia under the Kingdom of Pontus, then the Roman Empire's influence in antiquity. From the 6th to the 11th centuries, the area successively belonged to the Georgian kingdoms of Lazica and Abkhazia, who built a dozen churches within the city boundaries, the later was unified under the single Georgian monarchy in 11th-century, forming one of the Saeristavo, known as Tskhumi extending its possessions up to Nicopsis. The Christian settlements along the coast were destroyed by the invading Alans, Khazars, Mongols and other nomadic empires whose control of the region was slight. The northern wall of an 11th-century Byzantine basilica still stands in the Loo Microdistrict. From the 14th to the 19th centuries, the region was dominated by the Abkhaz, Ubykh and Adyghe tribes, the current location of the city of Sochi known as Ubykhia was part of historical Circassia, and was controlled by the native people of the local mountaineer clans of the north-west Caucasus, nominally under the sovereignty of the Ottoman Empire, which was their principal trading partner in the Muslim world. The coastline was ceded to Russia in 1829 as a result of the Caucasian War and the Russo-Turkish War, 1828–1829; however, the Circassians did not admit the Russian control over Circassia and kept resisting the newly established Russian outposts along the Circassian coast (Adyghe: Адыгэ хы аушу). Provision of weapons and ammunition from abroad to the Circassians caused a diplomatic conflict between the Russian Empire and the British Empire that occurred in 1836 over the mission of the Vixen. The Russians had no detailed knowledge of the area until Baron Feodor Tornau investigated the coastal route from Gelendzhik to Gagra, and across the mountains to Kabarda, in the 1830s. In 1838, the fort of Alexandria, renamed Navaginsky a year later, was founded at the mouth of the Sochi River as part of the Black Sea coastal line, a chain of seventeen fortifications set up to protect the area from recurring Circassian resistance. At the outbreak of the Crimean War, the garrison was evacuated from Navaginsky in order to prevent its capture by the Turks, who effected a landing on Cape Adler soon after. The last battle of the Caucasian War took place at the Godlikh river on March 18, 1864 O.S., where the Ubykhs were defeated by the Dakhovsky regiment of the Russian Army. On March 25, 1864, the Dakhovsky fort was established on the site of the Navaginsky fort. The end of Caucasian War was proclaimed at Kbaade tract (modern Krasnaya Polyana) on June 2 (21 May O.S. ), 1864, by the manifesto of Emperor Alexander II read aloud by Grand Duke Michael Nikolaevich of Russia. After the end of Caucasian War (during the period of 1864–1870) almost all Ubykhs and a major part of the Shapsugs, who lived on the territory of modern Sochi, were either killed in the Circassian Genocide or expelled to the Ottoman Empire (see Circassian Genocide). Starting in 1866 the coast was actively colonized by Russians, Armenians, Ukrainians, Belorussians, Greeks, Germans, Georgians and other people from inner Russia. In 1874–1891, the first Russian Orthodox church, St. Michael's Church, was constructed, and the Dakhovsky settlement was renamed Dakhovsky Posad on April 13, 1874 (O.S.). In February 1890, the Sochi Lighthouse was constructed. In 1896, the Dakhovsky Posad was renamed Sochi Posad (after the name of local river) and incorporated into the newly formed Black Sea Governorate. In 1900–1910, Sochi burgeoned into a sea resort. The first resort, "Kavkazskaya Riviera", opened on June 14, 1909 (O.S.). Sochi was granted town status in 1917. During the Russian Civil War, the littoral area saw sporadic armed clashes involving the Red Army, White movement forces, and the Democratic Republic of Georgia. As a result of the war Sochi has become Russian territory. In 1923, Sochi acquired one of its most distinctive features, a railway which runs from Tuapse to Georgia within a kilometer or two of the coastline. Although this branch of the Northern Caucasus Railway may appear somewhat incongruous in the setting of beaches and sanatoriums, it is still operational and vital to the region's transportation infrastructure. Sochi was established as a fashionable resort area under Joseph Stalin, who had his favorite dacha built in the city. Stalin's study, complete with a wax statue of the leader, is now open to the public. During Stalin's reign the coast became dotted with imposing Neoclassical buildings, exemplified by the opulent Rodina and Ordzhonikidze sanatoriums. The centerpiece of this early period is Shchusev's Constructivist Institute of Rheumatology (1927–1931). The area was continuously developed until the demise of the Soviet Union. Following Russia's loss of the traditionally popular resorts of the Crimean Peninsula (transferred from the Russian SFSR to the Ukrainian SSR in 1954 by Nikita Khrushchev), Sochi emerged as the unofficial summer capital of the country. In 1961, Soviet officials decided to expand the city limits by forming a Greater Sochi which extended for 140 kilometers from the southern parts of Tuapse to Adler. In July 2005, Russia submitted a successful bid for hosting the 2014 Winter Olympics in the city, spending around $51 billion in the process. Additionally, Sochi has also served as the location for the signing of many treaties, especially those between the Georgian, separatist Abkhazian, and separatist South Ossetian governing authorities. Greater Sochi is elongated along the Black Sea coast for 145 kilometers (90 mi). Sochi is approximately 1,603 kilometers (996 mi) from Moscow. The city of Sochi borders with Tuapsinsky District in the northwest, with Apsheronsky District and with Maykopsky District of the Republic of Adygea in the north, with Mostovsky District in the northwest, and with Georgia/Abkhazia in the southeast. From the southwest, it is bordered by the Black Sea. The vast majority of the population of Sochi lives in a narrow strip along the coast and is organized in independent microdistricts (formerly settlements). The biggest of these microdistricts, from the northwest to the southeast, are Lazarevskoye, Loo, Dagomys, central Sochi (Tsentralny City District), Khosta, Matsesta, and Adler. The whole city is located on the slopes of the Western Caucasus which descend to the Black Sea and are cut by the rivers. The biggest rivers in Sochi are the Mzymta, which is in fact the longest Black Sea tributary in Russia, and the Shakhe. Other rivers include the Ashe, the Psezuapse, the Sochi, the Khosta, and the Matsesta. The Psou River makes the border with Abkhazia. The northeastern part of the city belongs to the Caucasian Biosphere Reserve which is a World Heritage Site spanning vast areas in Krasnodar Krai and Adygea. Almost the whole area of the Greater Sochi, with the exception of the coast and of the area which belong to the Caucasian Biosphere Reserve, are included into Sochi National Park. Sochi has a humid subtropical climate with mild winters (average 11 °C (52 °F) during the day and 4 °C (39 °F) at night) in the period from December to March and warm summers (average 24 °C (75 °F) during the day and 16 °C (61 °F) at night) in the period from May to October. Sochi is unique among larger Russian cities as having some aspects of a subtropical resort. Apart from the scenic Caucasus Mountains, pebble and sand beaches, the city attracts vacation-goers with its subtropical vegetation, numerous parks, monuments, and extravagant Stalinist architecture. About two million people visit Greater Sochi each summer, when the city is home to the annual film festival "Kinotavr" and a getaway for Russia's elite. A UNESCO World Heritage Site, the 2,957 square kilometers (731,000 acres) Caucasian Biosphere Reserve, lies just north from the city. Sochi also has the region's most northerly tea plantations. Sochi has a humid subtropical climate (Köppen climate classification Cfa), at the lower elevations. Its average annual temperature is 18.4 °C (65.1 °F) during the day and 11 °C (52 °F) at night. In the coldest months—January and February—the average temperature is about 10 °C (50 °F) during the day, above 3 °C (37 °F) at night and the average sea temperature is about 9 °C (48 °F). In the warmest months—July and August—the temperature typically ranges from 25 to 29 °C (77 to 84 °F) during the day, about 20 °C (68 °F) at night and the average sea temperature is about 23–24 °C (73–75 °F). Yearly sunshine hours are around 2,200. Generally, the summer season lasts four months, from June to September. Two months—April and November—are transitional; sometimes temperatures reach 20 °C (68 °F), with an average temperature of around 16 °C (61 °F) during the day and 9 °C (48 °F) at night. December, January, February and March are the coldest months, with average temperature (of these four months) 11 °C (52 °F) during the day and 4 °C (39 °F) at night. Average annual precipitation is about 1,700 millimeters (67 in). Sochi lies at 8b/9a hardiness zone, so the city supports different types of palm trees. Sochi is situated on the same latitude as Nice but strong cold winds from Asia make winters less warm. In fact, temperatures drop below freezing every winter. The highest temperature recorded was 39.4 °C (102.9 °F), on July 30, 2000, and the lowest temperature recorded was −13.4 °C (7.9 °F) on January 25, 1892. Within the framework of administrative divisions, it is, together with one urban-type settlement (Krasnaya Polyana) and seventy-nine rural localities, incorporated as the City of Sochi—an administrative unit with the status equal to that of the districts. As a municipal division, the City of Sochi is incorporated as Sochi Urban Okrug. Sochi is administratively subdivided into four city districts: Tsentralny City District, Lazarevsky City District, Khostinsky City District, and Adlersky City District. Tsentralny City District, comprising the central portion of, is by far the smallest out of four in terms of the area, and the other three have comparable areas, with Lazarevsky City District being the biggest. In terms of the population, Tsentralny City District is approximately twice as big as each of the other three city districts. Michael Archangel Cathedral, a diminutive church built in 1873–1891 to Kaminsky's designs in order to commemorate the victorious conclusion of the Caucasian War. The red-granite Archangel Column, erected in 2006 in memory of the Russian soldiers fallen in Sochi during the Caucasian War. It is capped by a 7-metre bronze statue of Sochi's patron saint, Michael the Archangel. Sochi Art Museum occupies a large building with a four-columned portico, completed in 1939. The Neoclassical design is by Ivan Zholtovsky. Sochi Arboretum, a large botanical garden with tropical trees from many countries, and the Mayors Alleé—a landscape avenue of palm trees planted by mayors from cities around the world. The Tree of Friendship, a hybrid citrus tree planted in 1934 in the Subtropical Botanic Garden. Since 1940 numerous citrus cultivars from foreign countries have been grafted onto this tree as a token of friendship and peace. The associated Friendship Tree Garden Museum has a collection of 20,000 commemorative presents from around the world. The Winter Theater (1934–1937) is another rigorously Neoclassical edifice, surrounded by 88 Corinthian columns, with a pediment bearing the statues of Terpsichore, Melpomene and Thalia, all three cast by Vera Mukhina. Hall of Organ and Chamber Music. Located centrally in the city of Sochi it conducts organ, symphony, chamber-ensemble, choral, vocal music concerts. All year round the Sochi Symphony Orchestra, local actors of the city art groups, famous Russian and international performers, International Contests Winners and Laureates give concerts here. The Maritime Passenger Terminal (1955) is notable for its distinctive 71-meter-high steepled tower and four statues symbolizing the cardinal points. The Railway Station (1952) is one of the most remarkable buildings of Sochi. The Riviera Park was established by Vasily Alexeyevich Khludov in 1883 in the part of the city which later became known as Khludovskaya. The park is popular with tourists and local residents alike. It has a variety of attractions, including an outcrop of funny statues and a "glade of friendship" where magnolia trees were planted by every Soviet cosmonaut, among other notables. Lazarevskoye, 59 km (37 mi) from the city center, contains a delphinarium, an old church (1903), and a new church (1999). The settlement was founded as a Russian military outpost in 1839 and was named after Admiral Mikhail Lazarev. Loo, 18 km (11 mi) from the city center, was once owned by Princes Loov, a noble Abkhazian family. The district contains the ruins of a medieval church, founded in the 8th century, rebuilt in the 11th century, and converted into a fortress in the Late Middle Ages. Dagomys, 18 km (11 mi) from the city center, has been noted for its botanical garden, established by order of Nicholas II, as well as tea plantations and factories. A sprawling hotel complex was opened there in 1982. Dagomys adjoins Bocharov Ruchey, a dacha built for Kliment Voroshilov in the 1950s, but later upgraded into a country residence of the President of Russia, where he normally spends his vacations and often confers with leaders of other states. Golovinka is a historic location at the mouth of the Shakhe River. Formerly marking the border between the Ubykhs and the Shapsugs, the settlement was noted by Italian travelers of the 17th century as Abbasa. On May 3, 1838, it was the site of the Subashi landing of the Russians, who proceeded to construct Fort Golovinsky where many convicted Decembrists used to serve. The fort was intentionally destroyed by Russian forces at the beginning of the Crimean War, so as to avoid its capture by the enemy. Fort Godlik, of which little remains, had a turbulent history. It was built at the mouth of the Godlik River in the Byzantine period (5th to 8th centuries), was destroyed by the Khazars and revived by the Genoese in the High Middle Ages. Khostinsky City District, sprawling to the southeast from the city center, occupies approximately 374 square kilometers (144 sq mi), with a population of 65,229 as of the 2010 Census. The district is traversed by many rivulets which give their names to the microdistricts of Matsesta ("flame-colored river"), Kudepsta, and Khosta ("the river of boars"). 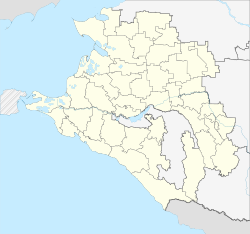 Adlersky City District, with an area of 1,352 square kilometers (522 sq mi) and a population of 76,534 people as of the 2010 Census, is the southernmost district of the city, located just north of the border with Abkhazia. Until the establishment of Greater Sochi in 1961, it was administered as a separate town, which had its origin in an ancient Sadz village and a medieval Genoese trading post. Among the natural wonders of the district is the Akhshtyr Gorge with a 160-meter-long cave that contains traces of human habitation from about 30,000 years ago. The upland part of the district includes a network of remote mountain villages (auls), the Estonian colony at Estosadok, and the ski resort of Krasnaya Polyana which hosted the events (Alpine and Nordic) of the 2014 Winter Olympics. Also located here are the largest trout fishery in Russia (founded in 1964) and a breeding nursery for great apes. Sochi has an ethnic Russian majority (~70%). The city is home to a sizable Armenian minority (~20%), which is especially notable in the Adlersky City District where they compose more than half of the total population. Most of Sochi's Armenian community are descendants of Hamshen Armenians from Turkey's northeastern Black Sea coast who came in the late 19th century and on. The rest are Armenians from Georgia (particularly from Abkhazia and Samtskhe-Javakheti) and Armenia (especially from Shirak Province due to the 1988 earthquake). The Byzantine Empire brought Christianity to the Sochi region in the Middle Ages. The region was relatively isolated before 1829. In the North, a few hundred Sunni Muslim Shapsugs, a part of the Circassian nation, lived around Tkhagapsh, near Lazarevskoye. The Circassians (also known as Adyghe) converted to Islam from Christianity in the 17th century. In the nineteenth century, Islam spread to the region. Currently, Sochi is a large predominantly Christian city, though there are thought to be around 20,000 Muslims (5% of inhabitants) living there now (the majority are Adyghe) plus other Eastern Caucasians, Turks, Tatars, and other smaller Muslim groups. A mosque was built in 2008 by United Arab Emirates in the central area of Bytkha, in addition to the old mosque being around 40 km (25 miles) north of the city center in the Adyghe aul of Tkhagapsh. There are around thirty Russian Orthodox churches, the largest being St. Michael's, and two monasteries, plus two Catholic churches, one in the center of Sochi and the other in Lazarevskoye. The Armenian community, which is important in Sochi, gathers in about ten churches. Sochi is home to the following high educational institutions (masters level degree and PhD): Sochi State University, Russian International Innovative University, and Russian International Olympic University. Sochi is also known for its sport facilities: a local tennis school spawned the careers of such notable players as Grand Slam champions Maria Sharapova and Yevgeny Kafelnikov (Kafelnikov spent much of his childhood here, while Sharapova relocated to Florida at the age of seven). In late 2005, the Russian Football Union announced that it was planning to establish a year-round training center for the country's national teams in Sochi. The city's warm climate was cited as one of the main incentives. Sochi is also the home for the football team FC Zhemchuzhina which plays in the Russian First Division and for the ice hockey team HC Sochi which plays in the Kontinental Hockey League. The nearby ski resort of Roza Khutor at Krasnaya Polyana was the location of the alpine and Nordic events for the 2014 Winter Olympics. In June 2006, the International Olympic Committee announced that Sochi had been selected as a finalist city to host the 2014 Winter Olympics and the 2014 Winter Paralympics. On July 4, 2007, Sochi was announced as the host city of the 2014 Winter Games, edging out Pyeongchang, South Korea and Salzburg, Austria. This was Russia's first time hosting the Winter Olympic Games, and its first time hosting the Paralympic Games. The site of a training centre for aspiring Olympic athletes, in 2008, the city had no world-class level athletic facilities fit for international competition. Severe cost overruns made the 2014 Winter Olympics the most expensive Olympics in history; with Russian politician Boris Nemtsov citing allegations of corruption among government officials, and Allison Stewart of the Saïd Business School at Oxford citing tight relationships between the government and construction firms. While originally budgeted at US$12 billion, various factors caused the budget to expand to US$51 billion, surpassing the estimated $44 billion cost of the 2008 Summer Olympics in Beijing. According to a report by the European Bank for Reconstruction and Development, this cost will not boost Russia's national economy, but may attract business to Sochi and the southern Krasnodar region of Russia in the future as a result of improved services. The 2014 Winter Olympics in Sochi saw concern and controversy following a new federal law approved in Russia in June 2013 that bans "homosexual propaganda to minors". There were also concerns over Islamist militants. The state-controlled RAO UES announced in July 2007 that it might spend 30 billion roubles (about US$1.2 billion) on upgrading the electrical power system in the Sochi area by 2014. The power generating companies Inter RAO UES and RusHydro would have to build or modernize four thermal power plants and four hydroelectric plants—and the federal grid company FGC UES has to replace the Central-Shepsi electricity transmission line, which reportedly often fails in bad weather. The new power line would run partly on power towers and partly across the bottom of the Black Sea. By 2011, the power supply of the resort area would increase by 1129 MW—of which 300 MW would be used for Olympic sports facilities. "The cost of the work is estimated at 83.6 billion rubles (about US $3.26 billion), of which 50 billion rubles (about US$2 billion) will go to investments in the electricity grid," the power companies announced. They did not say how much of the bill the state would foot. In February 2007, when UES had planned to spend 48.8 billion rubles (about US$1.9 billion) on the Sochi area, the share the state had been ready to pay 38 billion roubles (about US$1.48 billion) of that. The Silk Way Rally which is part of Dakar series took place in Sochi in 2010 for the last stage between the capital of the Republic of Adygea Maykop to the city of Sochi through Pseshwap. President Vladimir Putin reached a deal with Bernie Ecclestone for the city to host the Formula One Russian Grand Prix from 2014. The World Robot Olympiad took place in the Adler Arena Skating Center on November 21–23, 2014. The 2014 World Chess Championship between Viswanathan Anand and Magnus Carlsen was played in Sochi in November 2014, with Carlsen emerging as the winner. The Fisht Olympic Stadium was also used to host 2018 FIFA World Cup football matches. Since 2014, the city has hosted HC Sochi, who play at the Bolshoy Ice Dome in the Kontinental Hockey League, the biggest ice hockey league in Russia and eastern Europe. Public transport is represented mainly by bus and taxi. Sochi is served by the Adler-Sochi International Airport. Types of non-mass public transport include two funiculars (at the Central military sanatorium and Ordzhonikidze resort) and three cable cars (at arboretum sanatorium "Dawn" and pension "Neva") also has several cableways in Krasnaya Polyana. The Sochi Port terminal building was built in 1955 by Karo Alabyan and Leonid Karlik in Stalinist architecture. It is topped with a 71-meter steepled tower. Sculptures embodying seasons and cardinal points are set above the tower's three tiers. Five of the railway stations of Sochi were renovated for the 2014 Winter Olympics. These are Dagomys, Sochi, Matsesta and Khosta railway stations. In Adler city district of Sochi, the original railway station was preserved and new railway station was built near it. Another new railway station was built in Estosadok, close to Krasnaya Polyana. ^ a b c Городское Собрание Сочи. Решение №89 от 14 июля 2009 г. «Об утверждении генерального плана городского округа города Сочи». Вступил в силу со дня опубликования. (City Assembly of Sochi. Decision #89 of July 14, 2009 On the Adoption of the General Plan of the Urban Okrug of the City of Sochi. Effective as of the publication date.). ^ a b c d e f g Russian Federal State Statistics Service (2011). "Всероссийская перепись населения 2010 года. Том 1" [2010 All-Russian Population Census, vol. 1]. Всероссийская перепись населения 2010 года [2010 All-Russia Population Census] (in Russian). Federal State Statistics Service. ^ a b Russian Federal State Statistics Service (May 21, 2004). "Численность населения России, субъектов Российской Федерации в составе федеральных округов, районов, городских поселений, сельских населённых пунктов – районных центров и сельских населённых пунктов с населением 3 тысячи и более человек" [Population of Russia, Its Federal Districts, Federal Subjects, Districts, Urban Localities, Rural Localities—Administrative Centers, and Rural Localities with Population of Over 3,000] (XLS). Всероссийская перепись населения 2002 года [All-Russia Population Census of 2002] (in Russian). ^ Византийский храм в Лоо (in Russian). Архитектура Сочи. May 16, 2012. Retrieved January 30, 2014. ^ Голубева, Елена. Олимпийская столица - и для спортсменов, и для бизнесменов (in Russian). Komsomolskaya Pravda. Retrieved January 30, 2014. ^ a b Travel Destinations Sochi Russia by Michael Totten | Traveler's Guide 360 Archived November 12, 2014, at the Wayback Machine. Travelersguide360.com (February 11, 2013). Retrieved on January 3, 2014. ^ a b "World Map of Köppen−Geiger Climate Classification". Archived from the original on September 6, 2010. ^ a b Drozdov, V. A.; Glezer, O. B.; Nefedova, T. G.; Shabdurasulov, I. V. (1992). "Ecological and geographical characteristics of the coastal zone of the Black Sea". GeoJournal. 27 (2): 169. doi:10.1007/BF00717701. ^ "Сочи, Пхенчхан и Зальцбург — претенденты на Олимпиаду-2014". ITAR-TASS. July 4, 2007. Archived from the original (in Russian) on July 5, 2007. Retrieved January 7, 2014. ^ Rybak, Elena A.; Rybak, Oleg O. & Zasedatelev, Yuri V. (1994). "Complex geographical analysis of the Greater Sochi region on the Black Sea coast". GeoJournal. 34 (4): 507–513. ^ a b "Weather and Climate – The Climate of Sochi" (in Russian). Weather and Climate (Погода и климат). Retrieved May 14, 2016. ^ "Soci (Sochi) Climate Normals 1961–1990". National Oceanic and Atmospheric Administration. Retrieved May 14, 2016. According to 2014 official estimates, the population of Adlersky City District is 138,572, see "Оценка численности населения на 1 января 2014 года по муниципальным образованиям Краснодарского края [Estimated population on January 1, 2014 by the municipalities of Krasnodar Region]" (in Russian). Russian Federal State Statistics Service. April 15, 2014. Archived from the original on June 14, 2014. ^ Ayvazyan, Hovhannes, ed. (2003). Ռուսաստան [Russia]. Հայ Սփյուռք հանրագիտարան [Encyclopedia of Armenian Diaspora] (in Armenian). 1. Yerevan: Armenian Encyclopedia Publishing. p. 473. ISBN 978-5-89700-020-3. ^ a b c Karina Ivashko (July 5, 2010). "Sochi - from ancient sites to 2014 Olympics". Retrieved February 8, 2014. ^ "Rekhaniya". Jewish Virtual Library. ^ В ауле Тхагапш произошло знаменательное для верующих мусульман событие. (in Russian). Shapsugiya.ru (September 9, 2010). Retrieved on July 26, 2012. ^ International Olympic Committee (July 4, 2007). "Sochi Elected as Host City of XXII Olympic Winter Games". Retrieved July 4, 2007. ^ Bennetts, Marc (January 19, 2014). "Winter Olympics 2014: Sochi Games "nothing but a monstrous scam," says Kremlin critic Boris Nemtsov". Telegraph. London. Retrieved February 4, 2014. ^ "The Sochi Olympics: Castles in the sand". The Economist. July 13, 2013. Retrieved August 8, 2013. ^ "The Economic Impact Of The Winter Olympics: Not Great For Russia But Sochi Stands To Gain". ibtimes.com. International Business Times. February 8, 2014. Retrieved February 10, 2014. ^ BBC News – Q&A: Gay rights in Russia. Bbc.co.uk (August 13, 2013). Retrieved on January 3, 2014. ^ Winter, Jana (January 21, 2014). "US, Russian forces hunt jihadist widow feared inside Olympic zone". FoxNews.com. Retrieved January 21, 2014. ^ Silk Way Rally. silkwayrally.com. ^ English, Steven (October 14, 2010). "Russia set to announce race from 2014". autosport.com. Haymarket Publications. Retrieved October 14, 2010. ^ a b c Official website of Sochi (international). The page spotlights similarities of the twin towns to Sochi in that all of them are "summer resorts". ^ "Греческий Волос и российский Сочи стали городами-побратимами". Interfax. May 26, 2005. Archived from the original on September 30, 2007. Retrieved July 8, 2007. Законодательное Собрание Краснодарского края. Закон №679-КЗ от 1 апреля 2004 г. «Об установлении границ муниципального образования город-курорт Сочи и наделении его статусом городского округа», в ред. Закона №1756-КЗ от 3 июня 2009 г «О внесении изменений в некоторые законодательные акты Краснодарского края об установлении границ муниципальных образований». Вступил в силу со дня официального опубликования. Опубликован: "Кубанские новости", №64–65, 17 апреля 2004 г. (Legislative Assembly of Krasnodar Krai. Law #679-KZ of April 1, 2004 On Establishing the Borders of the Municipal Formation of the Resort City of Sochi and on Granting It Urban Okrug Status, as amended by the Law #1756-KZ of June 3, 2009 On Amending Various Legislative Acts of Krasnodar Krai on Establishing the Borders of the Municipal Formations. Effective as of the day of the official publication.). Wikivoyage has a travel guide for Sochi. This page was last edited on 31 March 2019, at 07:48 (UTC).